If you love the books, why not buy the music as well? 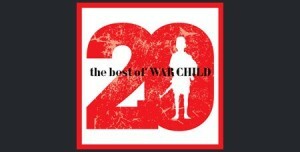 In 2013, War Child celebrated its 20th anniversary with the release of ‘War Child 20: Best Of’. To mark the anniversary the charity was presented with the first Special Recognition Award at the BRIT Awards. Paul McCartney features on the album twice; firstly as part of the Smokin’ Mojo Filters with Paul Weller, Noel Gallagher, Steve Cradock, Steve White and Carleen Anderson performing ‘Come Together’ from the inaugural War Child album ‘Help’. Paul’s second track included on ‘War Child 20: Best Of’ is ‘Calico Skies’ which originally featured on the charity’s follow up album ‘Hope’.